Meigs freshman Coulter Cleland drops back to pass, during the Marauders’ loss to Athens on Friday in Rocksprings, Ohio. 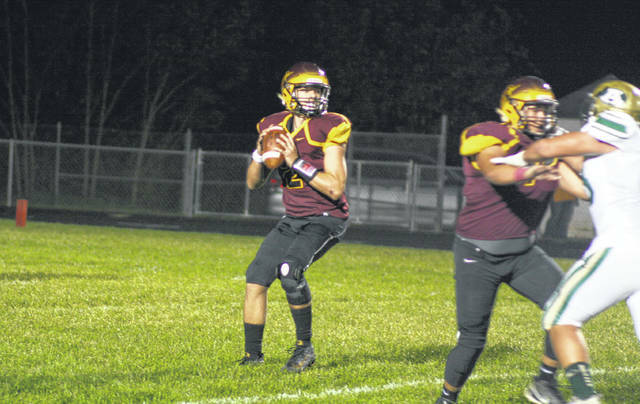 ROCKSPRINGS, Ohio — Athens quarterback Clay Davis accounted for 329 total yards and three scores in leading the Bulldogs to a 50-20 win over the Meigs Marauders on Friday night at Holzer Field/Farmers Bank Stadium. Davis a 6-foot-2, 218-pound senior carried 21 times for 182 yards and a pair of scores. He added 147 in the air and another touchdown to ruin the Marauders homecoming festivities. Meigs took the early lead just four plays into the contest, when freshman Coulter Cleland hooked up on an 83-yard scoring toss to Cole Adams,. After Levi Rafferty made the kick, the Marauders had a 7-0 lead at the 10:56 mark of the first period. On the Bulldogs second play from scrimmage, Evan Adams fumbled with Meigs recovering. However, two plays later, Logan Maxfield picked off a pass to end the Marauder threat. Davis scored his first touchdown of the day when he kept it from 18 yards out. Rider Stock added the extra point to tie the game at 7-all with 3:27 left in the first. Midway into the second period, Meigs was forced to punt deep in their own territory, Peyton Gail blocked the Marauder punt and recovered in the end zone for the score. Stock made it a 14-7 Athens lead with his extra point. The Bulldogs made it 21-7 when Nicholas Hawes scored on a 16 yard scamper, and Stock added the extra point. Meigs came right back, however, and cut into the Bulldog lead, with Cleland completing 6-of-7 passes for 89 yards in the drive. Abe Lundy powered over from a yard out, Rafferty added the extra point and the Bulldogs took a 21-14 lead into the locker room at the half. Davis went to the air in the third period hitting Nate Trainer from 17 yards out, Stock was once again true on his extra point and a 28-14 Bulldog lead. The Marauders came right back, however, and Cleland hit Weston Baer from 18 yards out. The kick was no good but the Marauders had pulled to within 28-20 with 3:09 left in the third. Corbin Stalder scored on a 13-yard run to make it a 35-20 Bulldog advantage, and on the second play of the fourth period, Davis scored from nine yard out. Stock added the extra points with 11:08 left in the game. Despite the Bulldogs having a 22 point lead, Davis set up the games last touchdown hitting Joey Moore for 33 yards to the Meigs 3, Hawes took it in for the score at the 3:34 mark, Gail ran the extra points in and to cap off a 50-20 Bulldog win. Davis led the Bulldogs with 182 yards in 21 tries, Evan Adams added 49 in eight carries. Davis completed 8-of-27 for 147 yards, Trainer caught three for 60 yards, Moore three for 69. Cleland was 21-of-34 in the air for 289 yards, Zach Bartrum caught seven for 112, Baer added five for 62 and Ty Bartrum five for 31. Zach Bartrum carried six times for 17 yards to pace the Marauders on the ground. Athens will host Wellston next week, while the Marauders host Point Pleasant.